L’article fût reproduit dans les grands médias francophones en ligne au pays, incluant Cyberpresse, Radio-Canada et Canoë. Notez que l’article de Radio-Canada n’est pas la copie exacte de celui de la Presse Canadienne, mais l’utilise vraisemblablement comme source. An article published on January 9th, 2008, by the Canadian Press reports on the presentation of the very succinctly titled “Célébration du Nouvel An chinois 2008”, presented at the Place des Arts on January 15-16-17, 2008. However, it fails to mention the ties, although avowed, that the organizers have with the Falun Gong sect (see the interview in the Montreal Mirror). This article from the Los Angeles Times writes about the controversy in the United States, where the Chinese New Year Spectacular is presented as well. The organizers deny that the show was organized by the Falun Gong, since it is financed by New Tang Dynasty TV and private donors. The problem isn’t so much religious organizations, legitimate or not, organizing shows for the greater public (which has the choice to attend or vote with their feet), but rather the small bit of missing information withheld or forgotten from the article, that would certainly shock francophone readers that might care. 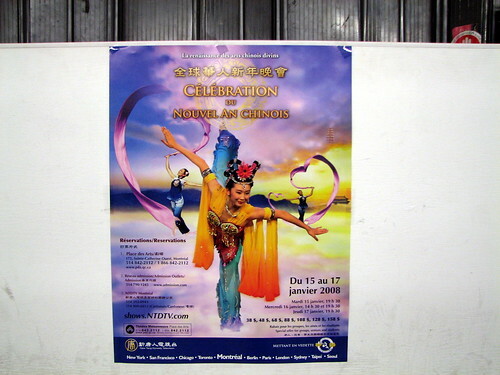 In fact, my friends will be going to another show (and there was a moment of confusion when they invited me along) called the “Gala du Nouvel An chinois 2008”, on February 2-3 at Concordia University. Contrarily to the other show, this one does not even seem to have enough resources to get itself a real website (and must hitch a ride with Sino-Quebec), or to just send out information in French. The posters look very alike, don’t they? The article was thus reproduced by the most important French-language online medias in the country, including Cyberpresse, Radio-Canada and Canoë. Take note that the Radio-Canada article isn’t the carbon copy of the Canadian Press’, but most likely uses it as a source. Que penses-tu de cela ? je ne trouve pas l’article très clair. Je pense qu’il s’agit du spectacle qui a été présenté à la Place des Arts il y a 2 fin de semaines et qui est en tourné au Canada. Un spectacle de cet envergure, organisé par le Fanlun Gong ? Bien sûr que Radio-Canada a annonçé ce spectacle puisque c’était une des activitées culturelles de la ville..
J’ai décidé, comme je n’ai rien fait durant le temps des fêtes, de souligner avec mes proches et ami(e)s le Nouvel An Chinois plutôt que la Chandeleur (soir du Mardi Gras) qui est toujours un mardi (donc on travaille !). Les Fêtes du Nouvel An Chinois (nongli xinlian) s’étendent sur 3 à 5 jours. Donc le week-end suivant ce sera toujours le temps de fêter. Tu es mon premier invité. J’espère que tu ne travaillera pas ! Je ne peux pas le faire le samedi soir (repas d’anniversaire familial oblige) MAIS on peut se réunir soit le vendredi soir soit le dimanche… Que préfères-tu ? lequel des deux jours est le moins risqué ?. J’ai congé les 7 et 8 février, c’est parfait pour préparer la maison. Appelle-moi si tu peux ou écris-moi ! I saw this show, it is awesome! Why all the fuss? The messages in the show were very peacefull. Oh, it had nothing to do with the show per se, but rather the sort of coverage that it received in French-language media via the Canadian Press. It’s like if some religious group from here went to China to talk about Canada/Quebec traditions, and then you fail to mention that it is organized by this given religious group. Another example: if say the communist govt was organizing / funding some New Year event overseas, I would expect to be able to read about it in the article if it is known information, as it is the case between the Falun Gong, and la Célébration du Nouvel An on Jan 15-16-17. I saw this show and was very disappointed by it. I felt it was pure propaganda for the Falun Gong (even the songs) and it was rather “amateur”. I would never recommend it to anyone. 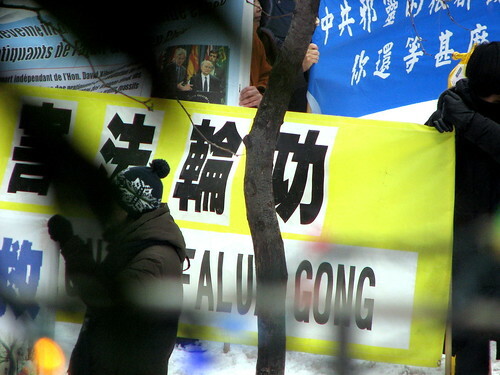 It is very dishonest and deceiving from the Falung Gong not to have mentionned its involvement in the publicity. After the show, I felt cheated (and the tickets were not that cheap for this kind of show).